Today at this job page you will have the recent job offer from DHA Karachi Jobs July 2016 Application Form Download Online. 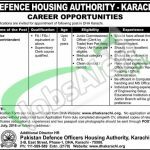 A well reputed housing authority which is known popularly by each and every person named "Defence Housing Authority" is located in every major cities of Pakistan but now currently i am going to discuss about the DHA Karachi is inviting the well educated, ocean of knowledge holding applicants for the single vacancy which includes Office Superintendent is required to fill this vacancy. The qualification which is required for this post includes FA/FS.C and the applicants must be supervisory clerk course certified will be eligible to apply for this post. Beside education the applicants should possess the 3 years experience as Superintendent, should be well versed ind rafting, knows the English language, proficiency in record keeping, managing the MS Office, Computer Skills and Engineering Setup will be given preference. The applicants educational institute must be Admin Branch will be given preference. After all these details the eligibility criteria includes the further information as the Retired JCO's and Retired Clerk by Trade from the Pak Army, Navy and Air Force are also liable to apply for this post. Age limit should be 52 years. The retired persons possess the AYE Medical Category and the employment record should be clear will be eligible to apply and employed. Attractive salary package will be admissible to the candidates according to their qualification and best conduct of expertise. So, don't wait but rush to apply soon. Now, let's have a look on its applying criteria ahead. The applicants meeting the said criteria wholly are required to apply by downloading the application form from this site and the given web link below. The applicants should be sent properly with the CV educational and experience certificates are required to be submitted through the good post and courier service. Last date for applying is 20th July 2016. The shortlisted and eligible applicants will be called for interview. Applications received and incomplete applications will not be entertained. So, all those applicants who are applying for the post so keep on visiting this page and be the first one to apply for these wonderful page and be the first one to tap to this job page and get latest job updates. Address: Pakistan Defence Officers Housing Authority, Karachi 2-B, East Street, Phase-I, DHA, Karachi 75500.